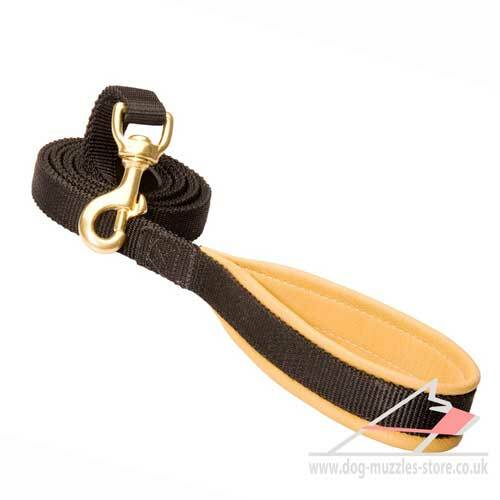 Dog lead is one of the general accessories needed for most dog owners. They are divided into several types, depending on dog breed and intended use. Pull tab is a lead for large dogs, that represents a loop, made of synthetic material or leather. This kind of dog lead is comfortable for leading a trained dog for a command "With Me" for not a long time before walking, before a dog may be set free for off-leash walking. This is a lightweight, compact, comfortable dog lead, that you may hang on your waist belt or put into your pocket. These pull tabs are used at dog shows of very large dogs, such as Black Russian Terrier. A dog comfortably keeps close to a leader at the ring and at the same time it does not interfere moves and may stay attached to a dog while it's walking in the box. 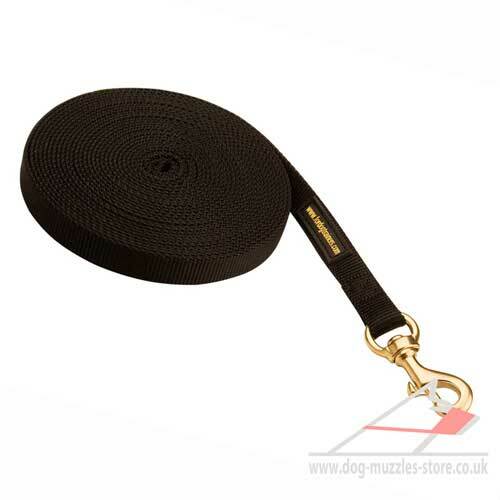 Our online dog store also proposes a combined variant of pull tab-lead, that easy converts into a short dog lead. 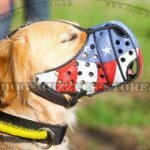 Pull tab is also used for dog training (usually in combination with prong dog collar) for control and correction of dog behavior. it has a length, that comfortably lays in dog trainer's hand and does not bother a dog while its moves. Short dog lead 3-10 ft long. Such dog leads are made of leather, metal chains, synthetic materials. 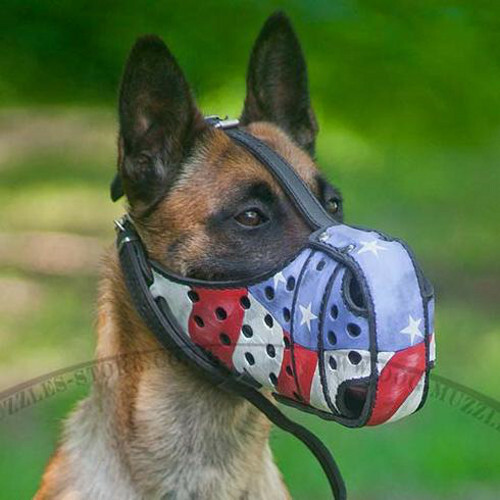 They are used for walking, shows, training and dog work (hunting, guard, patrolling). Long dog lead is from 10 to 33 ft long and sometimes more. They may be leather and nylon. Such dog leads are used in dog training, in order to give a dog maximum freedom but control its behavior at the same time. They are also used in tracking. 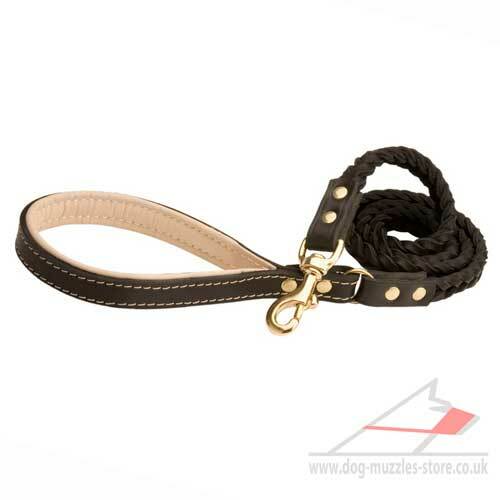 Leather dog leads are made of one or more leather layers. Leather should be strong, dense, but soft, in order not to hurt hands skin. the length of one-layer leather leads varies depending on dog lead intended use and dog breed. 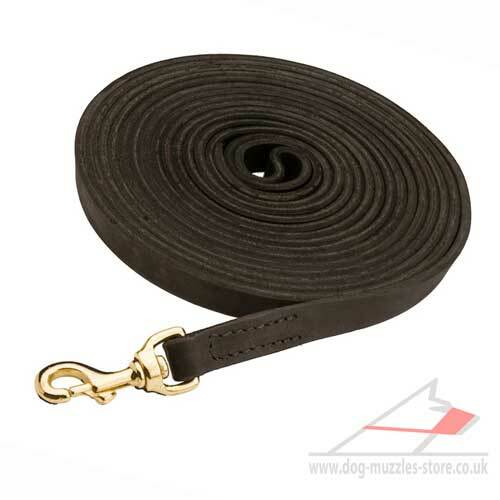 For example, there is used a dog lead 4-5 ft long and 0.8 inch wide for dog training. For dog show of, for example, Dobermans and German Shepherds, one needs a longer (more 7 ft) and thinner (0.4-06 in) dog lead. 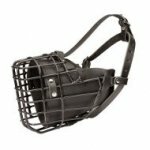 It is needed for letting a dog move free in the ring, and for comfortable handling, and at the same time it should not attract attention from the dog. Plaited leather leads are generally used as decorative walking variant. Such dog leads are uncomfortable for dog training, as well as they are not elastic enough and may hurt trainer's hands. Dog leads sewn from several leather layers are strong and good-looking, but not long-lasting, as well as the leather has the ability to stretch, and threads it it sewn with - does not stretch. That's why they turn apart and crack. 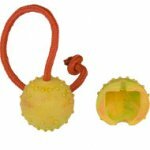 Because of the ability to stretch and sooth a pull, they are not recommended for use in obedience training. But while dog guard abilities, especially on a leash, such characteristic of dog lead may be useful, but only in the case, when the quality of dog lead guarantees reliability. Modern technologies of production let us propose to our customers dog leads without stitching of different width and length to 33 ft. While choosing a dog lead for your pet, turn attention not only on leather quality (density, thickness, width). Joints should be well-stitched but not fastened with rivets - they make material weaker and may tear at the most inappropriate moment. But we suppose that one of the most reliable joints is a plaited braid: leather straps are plaited with each other creating well-looking and strong joining. But for this the leather should be strong, elastic, well-done. That's why such joining may be a definite indication of quality of a dog lead in general. 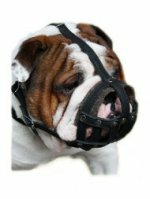 Besides, leather dog leads, as any leather item, demand special care and careful wear. Special oiling of our dog leads make them wet-resistant, but, nevertheless, in the case of strong wet these leads are not to be dried close to hot surface and open fire - leather gets hard and loses its outer look. 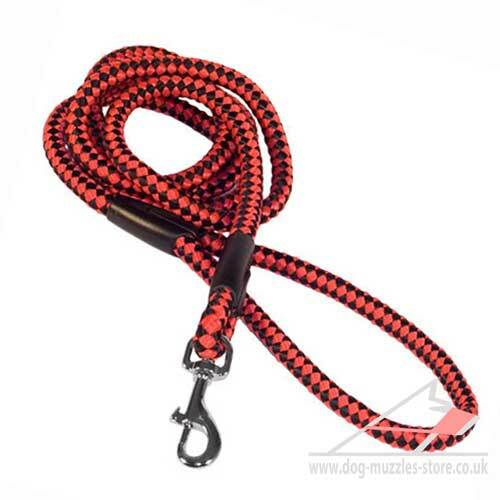 Synthetic dog leads are made of a nylon strap or of a rope. it is the most durable, practical and reliable kind of dog leads. The material undergoes huge loadings and pulls, well resists to any weather conditions. Quality made stitches and reliable fitting may make such dog lead practically everlasting. One more indisputable benefit of synthetic dog leads is that a dog owner may choose the color of a dog lead to it's taste and wish. Modern industry let us produce strap of different colors and illustration. 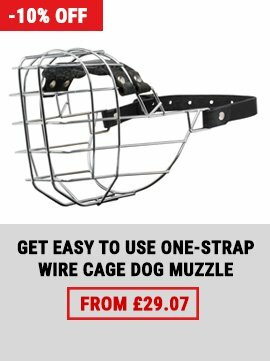 But one of the general lack of these leads is that the material hurts hands skin of a dog trainer when a dog is pulling. That's why professionals are forced to use gloves. A step to decision of this problem is producing of rubberized strap: the material of dog lead is stitched with rubber threads and it does not allow a dog lead to glide in hands and hurt them. Our dog store proposes such dog leads in different variants of length for many purposes of dog owner. 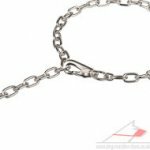 Metal chain dog leads are chains of different metals with various coating, usually with leather handle at the end. Such dog leads are good looking, and are quite reliable, depending on the manufacturer. 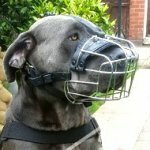 The general lack of such dog leads is that a dog owner cannot control a dog effectively enough. It is quite comfortable to keep a dog an a lead to its full length, but if there is a need to keep a dog close, especially when it pulls, it hurts hands. Such dog leads are not used for dog training to guard because chain may tangle and hurt the involved people and dogs. One more lack of chain dog leads temperature below zero - such dog lead is very uncomfortable for a human to keep with bare hands, and it also may let discomfort to a dog with short fur. Metal chain dog leads with snap links on both ends are comfortable for use in the cases when you need to leave a dog for some time on a lead. While choosing such dog lead turn attention at quality of dog chain links - all of them should be cast and the covering and polishing should be even, metal should not create sharp ledges and lines. 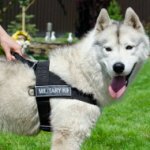 Combined dog leads are made of several types of material with the intention to use maximum of their benefits and sooth their lacks. For example, metal chain or synthetic strap with leather handle is successfully used as a walking dog lead, letting a dog owner the possibility to walk his dog comfortably on the full lead length. At the same time the synthetic rope, covered with soft leather, lets us original round dog lead, that combines reliability, strength and durability of synthetics and attractive look, style and comfort of leather leads. 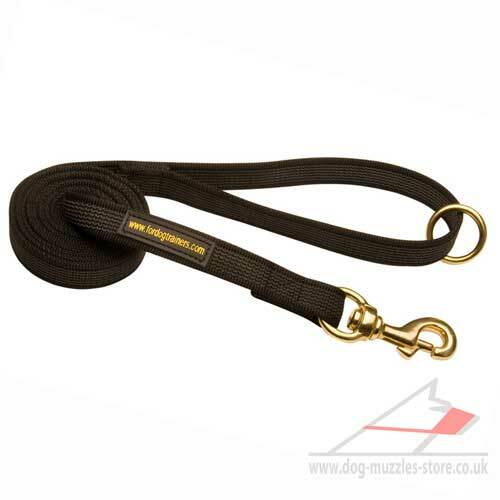 While choosing of round dog lead you should turn your attention at joining of a snap link to a dog lead. Sometimes it is fastened the same soft calve leather that covers the whole dog lead. Should we repeat, that such joining cannot be reliable and durable? Walking dog lead should be comfortable for everyday dog walking. According to the UK Law, a dog should be always on a leash in public places. That's why a walking dog lead should be maximum comfortable for a dog and for its owner. the choice of the material for dog lead depends on your wishes and taste. Its length may be different, it is important just to remember, that the longer a dog lead - the more difficult it is to control your dog. For instance, it is very difficult to fold 33 ft of leather or strap in a critical moment without experience (for instance, when there is a car going by your side). Too short lead will not allow enough space to a dog, that may also effect its behavior at home: a dog is looking for entrance of unused energy and lets harm to your property. 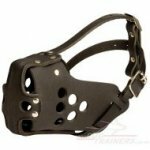 Training dog leads are used for obedience training and defense. Choice of such leads demands more care and attention. As a rule, their length vary from 4 to 6.5 ft. the choice of this length is due to the fact that generally the commands are trained first in close distance to a dog on a lead, and when the understanding is achieved - without lead at all. Special attention should be given to strength and reliability of a snap link. While dog training on a lead this factor impacts the safety of a person involved. 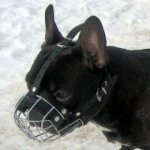 As a rule, dog owners choose dog leads made of synthetic strap for these intentions. Dog show lead (ringer) - is generally a thin rope made of soft leather 6.5-10 ft long or dog lead-hook. 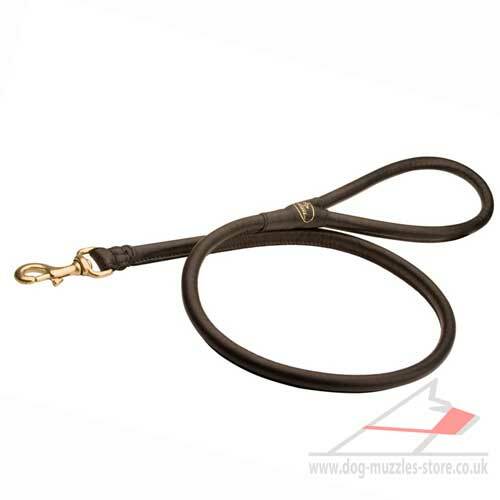 The length of dog lead should give a dog maximum space while walking in ring. Dog lead thickness, length, style of manufacturing depend on handler's wishes. For example, some specialists showing Dobermans prefer dog lead 6.5-8 ft long in combination with leather ringer, the others consider the variant, where a lead is combined already with the ringer, more comfortable. 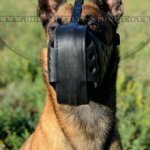 That's why before purchasing of dog show lead, it is better to consult with experienced handlers of your dog breed, and even better - with that specialist, who will show your dog. Tracking dog lead should not distract a dog from work on a track: lightweight, practical, long, untangling and not to catch on surface imperfections. As a rule, such dog leads are made of leather and are 33 ft long. Re-fastening dog lead is a comfortable and practical type of dog leads the construction of which allows to change its length and function. They have two snap links: general (fastened to a collar) and additional (a little less size). There are several rings on a lead strap, fastening to which the additional ring you will get another length of dog lead, may wear a loop on a shoulder or waits and this way set your hands free and have your dog by your side at the same time. 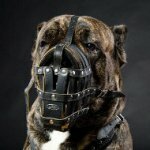 Such dog leads are made both of leather and synthetic strap. Coupler dog lead is indispensable dog equipment in the case when you need to walk several dogs. Even two leads may be uncomfortable for one person to keep. 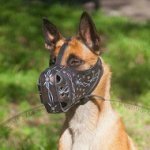 That's why fastening the coupler to dog collars and then a lead to the coupler, you get a possibility to control your pets with ease and comfort. Besides, a coupler may be used in training as well. For instance, coupling this way a trained dog with a young one, you will get better results at obstacle course. 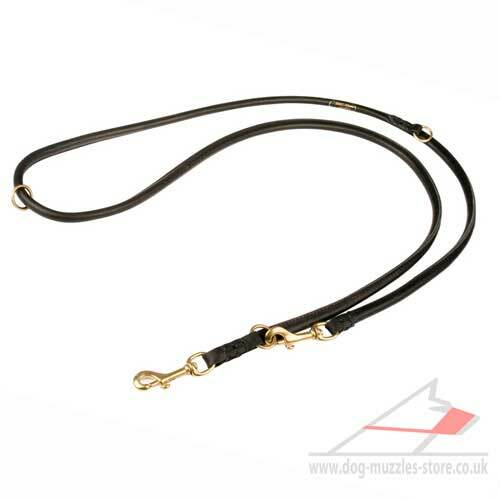 Special types of dog leads are leads made of rubber. In most cases such dog leads are used for work of a dog on a lead to stimulate and develop its guard instincts. Here also are dog leads for bikers, skier's pulling, running. 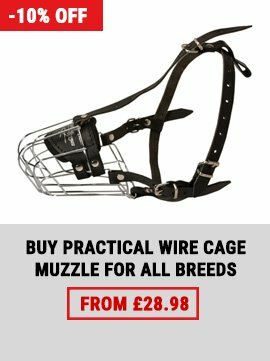 All these dog leads have special adjusting links for human belt and have their special features of construction that let use them with maximum effect. Here are also special dog leads combined with collar. They are not equipped with snap link and that's why they look more elegant and light. Retractable dog leads are equipped with roulette that allows tor regulate the length of a lead. They are widespread and the ability automatically to regulate the length is a good benefit. But the ability to control a dog with such dog lead is quite not enough. A dog lead is not able to retract fast in the case of emergency and it is dangerous to roll a thin lead by hands. That's why if you choose a retractable dog lead you should watch a dog and in time retract too long lead. When you choose a dog lead, define clearly the intended use and characteristics you need for it in this case. For instance, walking dog lead should be maximum comfortable for you and your pet, training dog lead should be reliable and practical, ringer - underlining benefits of your dog. Examine all the joints of the lead attentively. The stitching should be even and well fastened, threads should not stick up, rivet joints should be stainless, polished and placed at definite points. Special attention should be given to fitting - cast metal snap link should be heavy enough comparing to powder pressed one, but, as it is clear, cast snap links provide more reliability in everyday work.